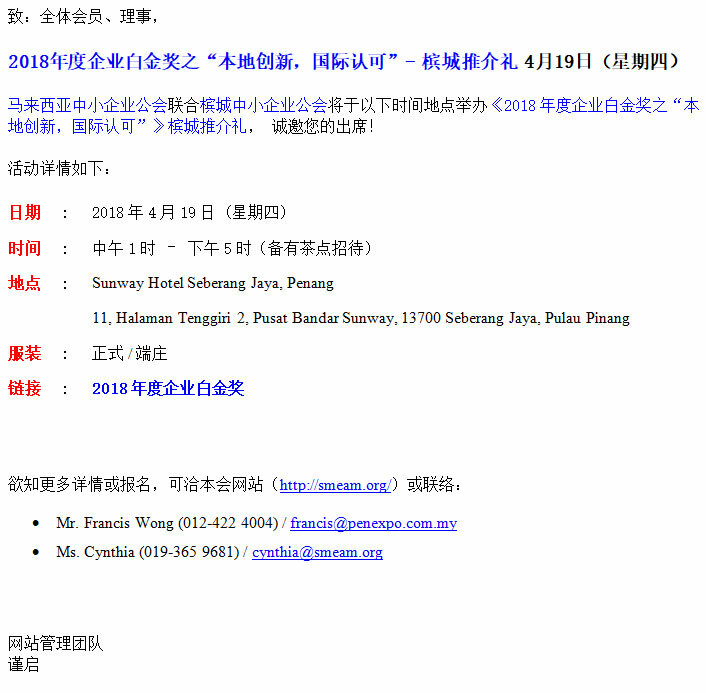 Please be informed that SME Association of Malaysia in collaboration with SME Association of Seberang Perai cordially invites you to participate in the “Platinum Business Awards 2018 “Local Innovation, Global Recognition”- Penang Roadshow” on 19th April 2018 (Thursday), 1.00 pm. The Platinum Business Awards 2018 are organized by the SME Association of Malaysia to recognize and celebrate the outstanding achievements of small and medium enterprises in Malaysia. The PBA2018 theme ‘Local Innovation, Global Recognition’ sounds simple yet its application, challenging. It aims to spur SMEs to champion innovation as a driving force of growth. The introduction of new, unique products to customers will differentiate your business from others, while venturing into worldwide markets will lead to global presence and recognition. As the merits of innovation multiply, this year’s theme is a call for SMEs to infuse new thinking, technology, and talent into their business model.